Ed Sullivan. M.C. of Toast of the Town, and Julia Meade introduce New Lincoln. Monitor sets show new rear deck, new longer body, new front assembly. First you notice its unusual beauty; the dramatic new tail-lights, the sweep of the chrome, the new front end treatment, the 11 1/2 inch longer body, the lower, flowing look. But perhaps even more exciting is the story on performance – further enhanced by new Turbo-Drive – biggest news in no-shift driving in almost 15 years. Here is no frustrating lag, no unpleasant jerk, but one unbroken sweep of silent power, from zero to superhighway speeds. Turbo-Drive is especially designed and built to work in harmony with Lincoln’s brand new, high torque V-8 engine for 1955. But you must feel this action to believe it. 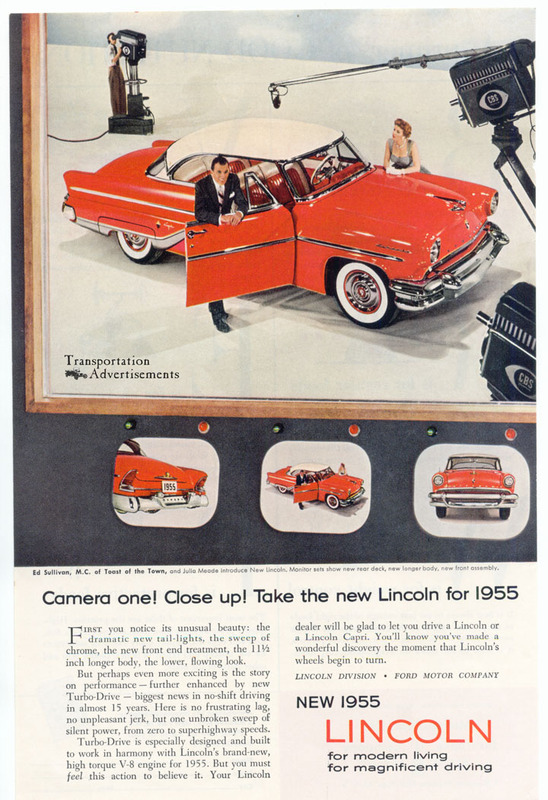 You Lincoln dealer will be glad to let you drive a Lincoln or a Lincoln Capri. You’ll know you’ve made a wonderful discovery the moment that Lincoln’s wheels begin to turn. Nowadays, you can tell the man by the car he keeps. Obviously, the car you see here belongs to a person who like to go places. And he likes to get there with a minimum of effort and a maximum of pleasure. 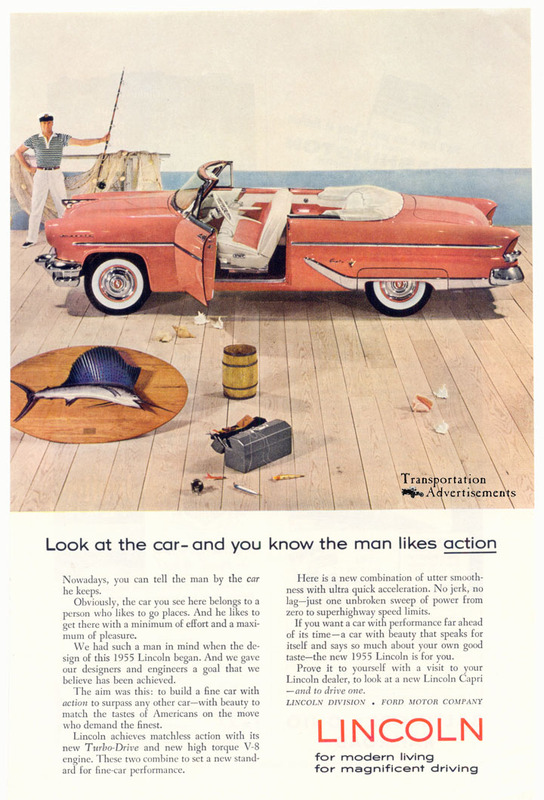 We had such a man in mind when the design of this 1955 Lincoln began. And we have our designers and engineers a goal that we believe has been achieve. The ain was this: to build a fine car with action to surpass any other car – with beauty to match the tastes of Americans on the move who demand the finest. Lincoln achieves matchless action with its new Turbo-Drive and new high torque V-8 engine. These two combine to set a new standard for fine-car performance. Here is a new combination of utter smoothness with ultra quick acceleration. No jerk, no lag – just one unbroken sweep of power from zero to superhighway speed limits. If you want a car with performance far ahead of its time – a car with beauty that speaks for itself and says so much about your own good taste – the new 1955 Lincoln is for you. Prove it to yourself with a visit to your Lincoln dealer, to look at a new Lincoln Capri – and to drive one. Transportation Advertisements is powered by	WordPress 5.0.4 and delivered to you in 0.443 seconds using 32 queries.